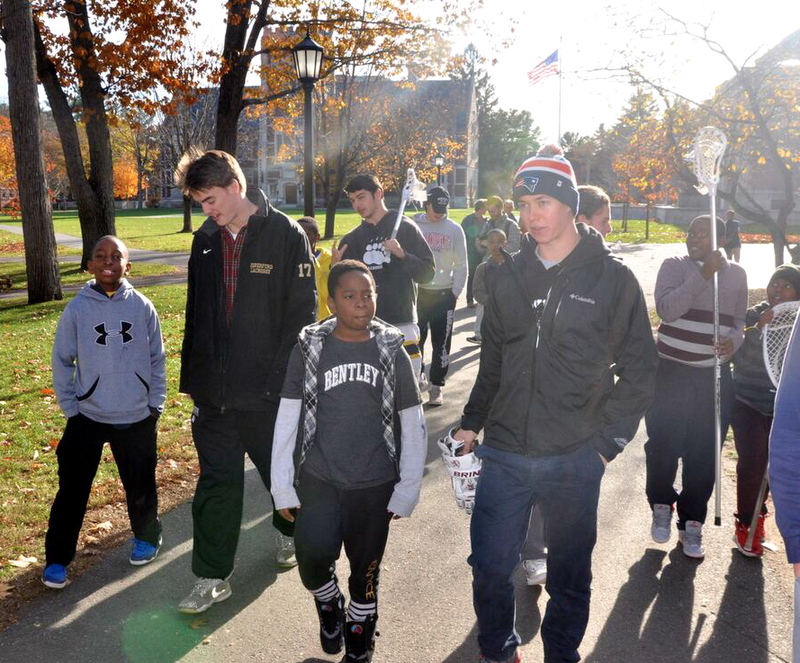 On November 12, the boys from Young Achievers in Boston had the opportunity to visit Bowdoin College to spend a day with Bowdoin’s nationally ranked men’s lacrosse team. Upon arriving to the Bowdoin campus, the student-athletes were greeted by members of the Bowdoin team and headed straight to the dining hall for a delicious brunch. The kids were especially excited that they were even able to get soft-serve ice cream on their waffles! After eating about as much food as humanly possible, each HL player paired up with one of the Bowdoin players to tour the campus and learn more about what it’s like to be a collegiate student-athlete. The tour culminated at Farley Field House where the group met up with Bowdoin’s head men’s lacrosse coach, Jason Archbell. Coach Archbell addressed the HLers before turning things back over to his players who led led a clinic for our student-athletes. The clinic was fast-paced, high-energy, and focused on developing fundamentals. The drills built up to a scrimmage, during which both teams paused to create our own version of the popular Mannequin Challenge. You can see our video on our instagram page @harlemlacrosse_boston! The only hiccup of the day happened when the team bus broke down, stranding us at Bowdoin for an extra four hours. Coach Archbell and one of Bowdoin’s captains, Peter Mumford, saved the day by setting us up with dinner in the dining hall and let the HLers use the gym to play basketball and touch football until a new bus arrived from Boston. Our student athletes loved the extended stay! We’d like to say a huge thank you to Coach Archbell, Bowdoin captains Peter Mumford, Max Nordeen, and Alex Osgood, as well as Nick Funnell, and the rest of the Bowdoin men’s lacrosse team for setting up such an amazing day for our student-athletes. We can’t wait to cheer Bowdoin on when they come to Boston to play this spring!